At the west end of the Long Ashton road, there's a double mini roundabout. Classic cycle paths marked in fading paint provide a safe off-road route between the junctions where the plebs of the 47% are rightfully denied rights of way. Due south, a nice segue into the A370 as the Dual Carriageway begins. That 40mph sign is one of those "pretend" signs; the curves on that approach road are designed to help you accelerate up to speed. This is why we don't want to encourage cycling, cyclists will only get in the way on the left turn here, expose themselves to risk, get run over, and then blame innocent motorists. They say there is safety in numbers, but there is only one number that is safe: zero. Some people may say "this is classic unplanned mediocrity", They are mistaken. as you can see from the signs at the mini roundabout, the Elf-Kingdom's Highway Laboratory is adjacent to these junctions, these roads, these cycle paths. These roads, these bike paths, these junctions are not accidents. They are by design, and the designers drive along here every day, looking at their work and being proud. We in the Bristol Traffic Team salute the Highway's Laboratory Staff! The roads outside their offices are a great experiment in how all of Somerset's roads could be! The sooner the better! In the elf kingdom, we visited the road where the campaigners campaigned, sheep like, for an off-road alternative to the 50 mph road -probably involving some pavement widening. They are being greedy. Look, there is already some space for them under the hedgerows! Yet despite these facilities, they cycle in the road! No wonder the elf-folk complain! At the end of the route, we see exactly the pedestrian/cyclist conflict points people discuss, as a piece of white paint demarks the route where cyclists can get onto the pavement by a roundabout, with 5 metres of traffic free cycling. Yet again, some of the tax dogers use the roundabout! Despite the money spent on paint! While we agree that there is no justification for a bike path, here, we will point out is that the claim that this is for pedestrian safety is bogus. Nobody walks here. Where they do walk is on Yanley lane, Long Ashton, There is a school behind this blind corner where the speed drops from 60 mph to 30 mph, yet the entirety of the pedestrian safety here is a sign saying "school" and "look out for pedestrians" -signs too small to read when you are doing 60mph. There is no way that the residents of Long Ashton to say that they care about pedestrians being hit by cyclists when they don't care about their own children being hit by cars except to spend 50 quid on a road sign. No, that's a totally bogus argument and they should feel embarrassed to be so blatantly hypocritical, "We would rather have a risk of schoolkid/car collisions than accept any traffic calming or pavement on yanley lane", destroys the argument "we can't have a cycle path on a widened pavement that nobody ever uses". No, they should stop lying and come out fighting, the way the elf-king himself has done. This cycle lane should be stopped because the tax-dodgers are undeserving plebs who are never grateful for anything. our range rover went out to the Elf Kingdom in a follow up to the Long Ashton Saga. It has this strange kind of terrain, that is all green, with roads that finally justified our ownership of a 4x4 that rarely leaves clifton. If Somerset is the Elf Kingdom, what is that whiteness in the far distance? Here we can see the fortresses on the hill, Dun--st-Michael, home to the fabled white tower, the "Chimney of St Michael's Hospital". Behind the city, the green hills of the Shire of South Gloucester. When Tolkien introduced the elf-lands and Gondor to the masses, one thing he failed to discuss was how the Elves commuted into Gondor down the A370 every day. For that is truly how the Elf-folk visit the city of men. Someone, "Nuxx Bar", posts a comment on our "tolerance" post, in which we congratulate the car driver for pulling over to completely block the cycle path when they break down, rather than, say, half blocking it. Here is the comment in full. I suppose you're yet another car-hater who lies and "cleverly" claims not to hate cars because you think such dishonesty will advance your cause? No? Then what exactly was that evil motorist supposed to do once he'd broken down? He had to put his car somewhere, and the cycle lane was the only practical place. So his behaviour was blameless, and it's clear that you're having a go at him primarily because you think he shouldn't have been driving in the first place. So you're a car-hater. Admit it. Of course, the cycle lane in question is probably exactly like other cycle lanes, i.e. it rarely if ever gets used. This is because cyclists like you refuse to use such facilities on "principle": you have to make a point about being "proper traffic" and "not being shoved out of the way", even if it means putting yourself in unnecessary danger...at least you've got in the way of those evil drivers and reminded them that you're there and you hate them, eh? This, of course, doesn't stop you and your ilk vociferously demanding the building of such facilities at public expense, even though you don't pay ROAD TAX (which is what it is really, as you well know). But you don't want the facilities so that you can use them, you just want them to take roadspace and cash away from drivers. Not that you hate cars, definitely not. When will you and your psycholist mates just give it up and admit that there's a war on the motorist and you're a vigorous supporter of that war? Do you really think the pretence that it's all about "safety" is fooling anyone? Do you approve of safety improvements like dualling the A9, or only those purported safety improvements which restrict or punish drivers in some way (even when they haven't been shown to improve safety at all)? Now why oh why could that be? Who do you think is being fooled by the "I don't hate cars / "There's no war on the motorist" lies? I'll be checking back to see if you've been brave enough to approve this comment and/or make a reasoned reply which (gasp) actually has an honest go at addressing the points made (your ilk are hardly renowned for the latter). You've gone to the trouble of making an anti-motorist blog so you might as well address adverse comments...if you think you can without losing the argument, that is. Nuxx Bar is clearly confused. We both agree that the government is conducting an illicit war on the motorists -take the current M4 traffic jams for example. They say that they are spending 85 million pounds to add new lanes and "traffic management", but really they are putting in variable speed limits to make driving harder. Nuxx Bar has, as they say, a history. Indeed, a wiki entry. Even more than that, someone has had to go to court to find them & so stop them harassing them. We can't be arsed to talk to plebs. Given Nuxx Bar's record, their comments will be summarily defeated. This country is not a democracy, after all, it's a monarchy and we have absolute powers. Bristol Council reclaims Thomas St for Parking! 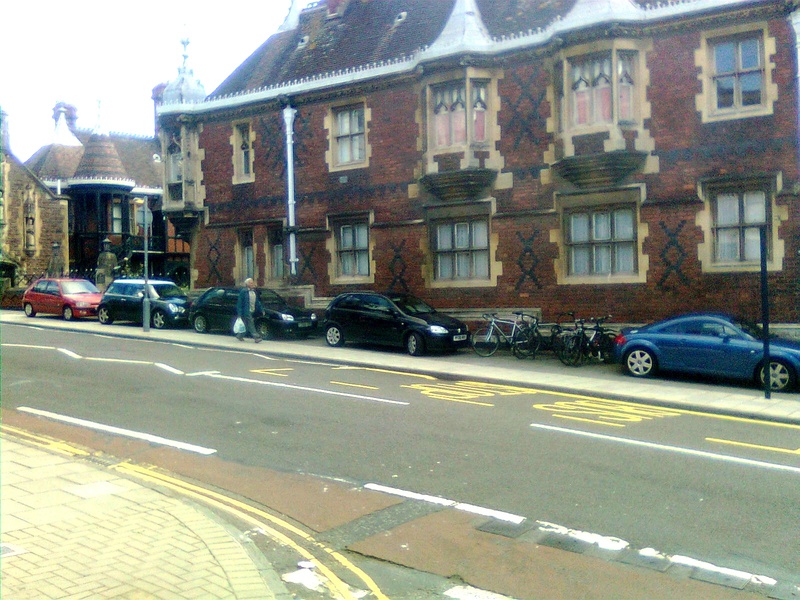 With the rollout of the Kingsdown RPZ, one of the secret parking places of the city was lost. No longer double yellow lines. No longer (as it was before), a fading Keep Clear sign -still shown on Google Maps.. Now there is a sign proclaiming that any resident can park here on weekdays; anyone evenings and weekends! We do note that this is actually marked on the Bristol Cycling Maps as a recommended cycle route, and fear that without formally closing the road the markings are invalid -hence some tax-dodging troublemaker could get cars ticketed for obstructing the highway. The shocking thing about plebgate is not that a Tory MP called the police plebs, but that the police failed to arrest him while shouting "you are a pleb" -because irrespective of what school he went to, he was on a bicycle and should know his place. We are also shocked by the many such plebs cycling round Stokes Croft this morning. Whole families going down the road itself. At the base of nine tree hill, families pulling over to buy their children baked snacks & sandwiches, while others use the new contraflow to get onto the croft itself. Looking up the hill, a row of pedestrians, many dismounted cyclists on account of the 20% gradient. One such dismounted cyclist was on the phone, even while a small child was on the back of the bicycle. we have no idea what these new lumps of concrete embedded in Southwell Street are. There's a BBC Radio Broadcase in which Elf-King Ap-Rees, Deputy-King of the Elf-Kingdom of North Somerset, denounces cyclists as arrogant as the "cyclists use the cycle ways instead of arrogantly ignoring them and cycling on adjacent roads". The issue was a petition"ill-judged and unnecessary" that stirred up people to sign a petition that demanded that the council actually approved of the cycle path by the 50 mph road from Long Ashton to Cambridge Batch. It was always going to be built, just "a bit of a quibble" with Long Ashton Parish Council. Like the way they slowed down the provisioning of a cycle route alongside the A370 by Ashton Court -there were concerns that the council would reject it the way they rejected the Ashton Court stretch of the route -the bit that would cut across the newly-expanded Ashton Court car park. "We're spending all this money on cycle ways and yet I'm always getting complaint that say the cyclists don't use them -they use the roads instead!" Why is his language so inflammatory? "I'm glad it is! I want cyclists to realise that other people see this money being spent on cycle ways and actually object when the cyclists don't use it. Especially when we have 60 mph roads, and we have a cycle way absolutely adjacent to it -and yet you still find cyclists using that (ed: the road?). They cycle through pedestrian areas, you know, which they're not supposed to do..."
why have you approved this then? "We want to encourage cycling. We want to encourage cyclists to use the cycle ways. What I'm hoping is that as a result of this...and it's not everybody, you just get a few cyclists -just as you get a few motorists doing things wrong. The trouble is they set a bad example -erm- to everybody else"
People who don't live in the vicinity of Long Ashton have no influence over the decision as as they "have one sheep-like point of view "
Elf King App Rees is the one politician who will stand up and say the prejudiced ill-informed views that we live by! Only he is the one not afraid to call cyclists sheep-like. Indeed, he's proud of it! "I'm always getting complaints from people about the behaviour of cyclists..."
That said, we don't like this idea of saying "local decisions only". Because that's going to come back to haunt the commuters of N Somerset when Bristol City starts rolling out anti-commuter strategies like speed limits. Similarly, we worry about the quote : "North Somerset Council has to consider all road users and the decision will be made with that in mind, not to just satisfy a cycling lobby." This surprised us as we didn't know there was a cycling lobby in N. Somerset. That phrase "all road users" scares us. Why should we -the tax payers- care about the cyclists? If he's going to start taking their interests into account, what will this mean to features like the new Portishead/M5 junction, where the Elf King said "the misery of prolonged hold-ups for motorists in this area should be a thing of the past.". See that? No need to acknowledge the existence of cyclists there, let alone the need to consider them at a new junction. Similarly, when he's considering parking charges in Portishead, will he actually worry about the needs of tax-dodgers who may want to cycle there rather than all the people who petitioned against the charges? We hope not! Finally, "sheep-like". Again, that could equally well be applied to most of the people who write to him complaining about tax-dodging cyclists being in the way on the roads or on the pavements. That's the same class of insult as one of the two groups on the Evening Post comment pages calling the other lot "inflexible and narrow minded". No, you don't want to go there. Elf-King App Rees does like those emails complaining about cyclists, so feel free to contact him on such topics, or where he stands on the battle of Mordor. While we know he doesn't accept emails from cyclists outside the Elf Kingdom of Long Ashton, we don't yet know if he loves getting message from outside the Shire congratulating him on being the first Evening Post commenter to get radio time on a regional station listened two by a double-digit audience! While here in Bristol the local rag is obsessed by pavement cycling, Swindon drivers have their own way of dealing with road closures... Pavedriving!. It's exciting, free, and should be an Olympic sport. There's an article in the Independents aying "Helmet Cameras are useless and the police can't do anything with the videos". Sadly we fear this is untrue: the police can prosecute drivers with the videos -if they choose to do so. The fact that most of the country hasn't seen any such prosecutions is due to the police, not the law. Sadly, because Bristol police do intervene. 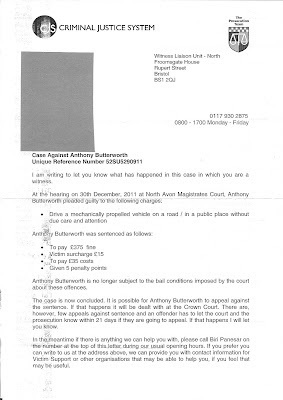 Here is the sentencing letter from a small incident in which the car R242AAC forgot to give way to cyclists on a roundabout. We have covered this here and here. 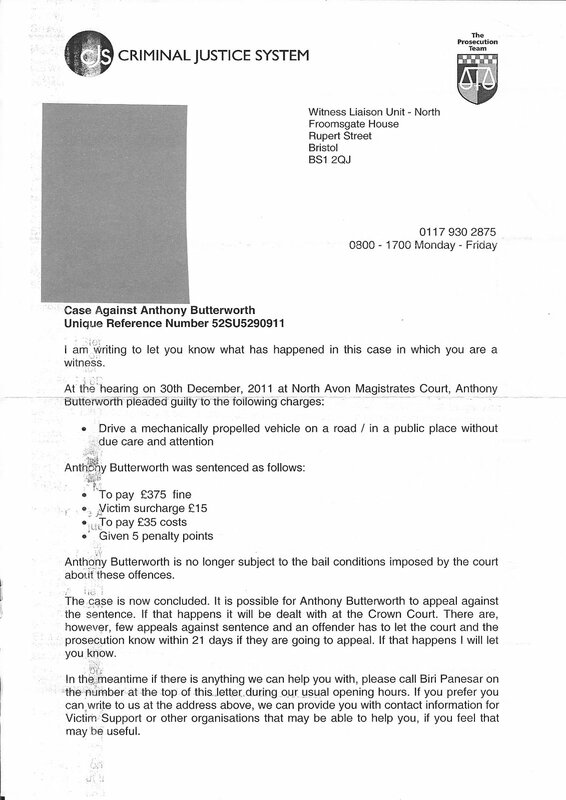 I am writing to let you know what has happened in this case in which you are a witness. Drive a mechanically propelled vehicle on a road/in a public place without due care and attention. Five penalty points merely for nearly running two cyclists over? It's that -and the impact on the driver's insurance that hurts. Admittedly, he did pull straight out onto the roundabout without looking, but it was a quiet bank holiday. He had no reason to expect people to be on bicycles at that time in the morning. The war on the motorists will not be over while the police are using helmet camera videos to impose fines and penalty points on law-abiding motorists! "I am pleased that finally this driver was punished for their actions. The police and Jon Rogers were very supportive all through this process -going to a lot of effort to track down and prosecute the driver. I would like to thank everyone involved. As you can see from the video, my son was wearing a helmet, and he has taken part in the council-backed cycling courses, which instruct children how to cycle safely in our city. As you can also see, this does nothing to address the fact that some drivers are selfish and dangerous. You can tell people what the safe position for vehicular cycling is, but unless the drivers look -or care that you are there-, you are still in danger. The next time someone tries to argue that vehicular cycling is the right approach, that safety in numbers is the answer -and dutch style cycling paths a mistake -point them at this video and say "how could these people have cycled more safely?" Well, they have the right to their opinions, no matter how misguided they are. We just close with the thought that a police force enforcing laws against motorists for such minor infractions of traffic laws could be one of the most dangerous parts of a cycling city. Pesky cyclists. As you can see from the picture, these bicycles are taking up far too much space from an important Pavedrive & Paveparking facility. We could easily squeeze another hatchback in there.